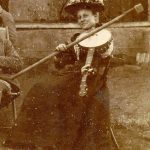 Welcome to an ongoing series we’re doing where we spotlight famous banjo players from throughout history, both historic and modern day. Today we look at Pete Seeger, a musician who everyone into folk music probably is aware of, and a fantastic banjo player to boot! Pete Seeger was a folk musician whose iconic songs fuelled a generation of civil rights marchers, activists, and regular people who cared about the world. He wanted to shine a light on injustice and did so by writing and singing songs that others could rally around. Pete Seeger was born on May 3, 1919. His parents were involved in music. Charles Seeger taught music at the University of CA at Berkeley while his mother Constance taught violin at Julliard. Pete has two siblings; Mike and Peggy. They would both become musicians as well. Admittedly, this is all quite amazing that his whole family was so musical to such a large extent. He was educated in a boarding school in Connecticut before heading off for two years of Harvard on a scholarship. He lost his scholarship and spend much of the late 1930’s riding freight trains and hitchhiking around the country. He was focused on writing his music at this time. He started a quartet of folk musicians called the Almanac Singers with an occasional appearance by Woody Guthrie who was a friend of Seeger. While this would seem like it would begin his music career, it was actually stopped short when he was drafted into the army. He was married in 1943 and returned to music after the war ended in 1945. He started performing again and helped found a music magazine called Sing Out! Finally, in 1948, he formed the group The Weavers, which is where he started to become well-known, and the group had some major hits as well as bringing back some major classics. After some success with music in the late 40s and early 50s, there began to be some whisperings of his political ideals. His group was labeled communist by the FBI. This brought the group to a halt because they were banned from performing in various venues around the U.S. They took a break for 3 years – 1952-1955. Eventually, Seeger left the band in 1958. Around 1961, he was ordered in front of Congress to answer questions about his un-American political views and activities. Music censorship had seemed to rear its ugly head once again, and anti-American sentiment, it seems that in this moment, thy name was embodied in the person of one Pete Seeger. Pete refused to answer any questions, so he was held in contempt. Instead of pleading the Fifth Amendment, which states that his testimony might incriminate himself, he actually pleaded the First Amendment saying he wouldn’t answer any questions regarding his political, religious, or philosophical beliefs as well as how he voted in any elections. During this time, he was still performing where and when he could. No doubt, he was compelled to greater artistic heights due to his literal trials and tribulations. He then produced and released his biggest hit “Where Have All the Flowers Gone” in 1961 and “Turn, Turn, Turn” in 1962. He participated in anti-war movements and civil rights protests in the 60s, too. He recorded a song called “Bring ‘Em Home” in 1966, which was about bringing soldiers home from Vietnam. Seeger continued to release albums and wrote a historical book on civil rights, musicians and folk music throughout the 20th century called The Incompleat Folksinger. It wouldn’t be his last book. The singer and activist brought folk music to the world in a time when there was controversy and war. His music brought awareness to the environment, civil rights, and other causes he believed in over the years. He wrote songs like “Where Have All the Flowers Gone?” Many of his songs leaned toward folk music, which spoke to the problems of the time, and many were played on a banjo in the early years. Many banjo players credit Seeger with bringing them to the 5-string banjo. In 1948, he wrote a manual of how to play the 5-string banjo. He recorded an instructional album called “How to Play the 5-String Banjo,” which was originally self-published. The third edition of the album was reprinted in 2013. He explains and provides examples of tunings and techniques like “hammering on” and other basics like “frailing” to listeners. You can actually see some of his videos on YouTube where he shows viewers how to perform basics on the banjo. Seeger spent his early years on a banjo. 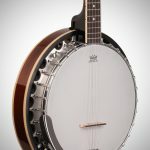 Along with a manual and an album, Seeger would play the long-neck banjo and bring it into the spotlight. He invented his own strumming style, which was called up-picking, which was part of his teachings when he brought the manual and recording to print. This strumming that was particular to Seeger would accompany his songs where the words were as vital to the song as the melody and instruments. His music has had a lasting impact on the world with many of his songs flowing from one generation of music lovers to the next. There have been dozens of musicians who have done covers of Seeger’s songs, and although he died in 2014 at the age of 94, his legacy will continue for years into the future. The originals as well as song covers mean it’s unlikely that he’ll be forgotten.